I’m only linking to this because I happen to like meta-things. Which online personality test are you? I was the Internet Addiction Test, quite ironically. I didn’t feel like actually posting the results graphic in here. I decided to take another crack at getting the printer working today, and I delved into Samba stuff, backed out of that, then delved into Apple Talk stuff, backed out of that. Then I had a sudden idea, and tried printing on the Macintosh, which could already print via AppleTalk, but instead via lpr. It worked. I then tried printing on the Linux machine via lpr. I then took the magic step and restarted the print server on the Linux machine, and tried printing on my Windows machine through the Linux machine. I was at this point before, but this time I realize what I did. Hopefully this configuration won’t undo itself if the server restarts. This has been bothering me for a while, but it’s gotten worse recently. Sometimes, when I’m tired, I have trouble finding the right words when I’m typing or speaking. When I’m typing, it’s not a big deal, unless I get really stuck, and end up stalling the conversation. When I’m speaking, it’s a bit more serious though. I’ve noticed myself doing this a lot, and so far, no one has commented on it, as it wouldn’t be tactful, but I’ve been repeating a lot of words while speaking. Sort of like a verbal backspace, but it ends up sounding like I’m stuttering. I know it must be annoying to listen to, if only on a subconscious level, but it’s even more annoying to listen to it as it’s coming out of your own mouth. My memory has been getting worse and worse… there are some things that are burned into my brain that I’ll never forget, but there are other things that drift away. Last night I spent almost a half an hour of the time I was sleeping trying to remember the name of the movie “Almost Famous.” I knew the movie, I could see whole scenes from it, but for the life of me, I couldn’t remember the title. This is just an example, of course, and can be passed off as just “forgetting.” But when I’m in the middle of a conversation and I suddenly stop talking because I can’t remember a simple word, and I refuse to keep talking until I find the exact word I was looking for, it becomes a bit more noticeable. It’s so empty and quiet here at work. It’s a shame I actually have a significant amount of work to do. Nothing like some good ol’ anger to get you in the holiday spirit. That, and sugar. Lots and lots of sugar. So much sugar at my desk… need insulin…. On the way home a few days ago, there was a live-acting nativity scene in front of a church. First time I’d seen one of those. We got our annual company holiday present, which this year was a bit more useful for other people than for me… seeing as I already had the previous model, which wasn’t that outdated. At least I ended up getting a free 64MB MMC card out of the deal. I am so very tired. I don’t understand why. Perhaps because it was raining so hard it was making a dull roar that kept me from getting enough sleep? Luke is taking the PS2 home with him, so no Final Fantasy X for me over the weekend. I guess I’ll have to settle with Dragon Warrior 7. I know I had something else to say, but I’m so tired I can’t think. Blugh. 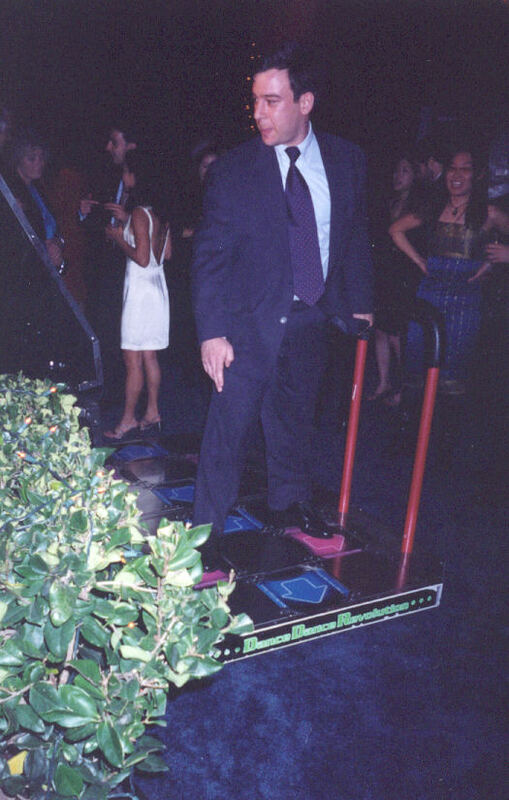 Yes, I was DDR’ing in a suit. Yes, my feet hurt afterwards. An entirely NEW type of SPAM! I am now getting junk faxes to my efax account. The high point of the evening had to be the Dance Dance Revolution game, though. As a part of the festivities, they had a bunch of video and pinball games set up in one section. 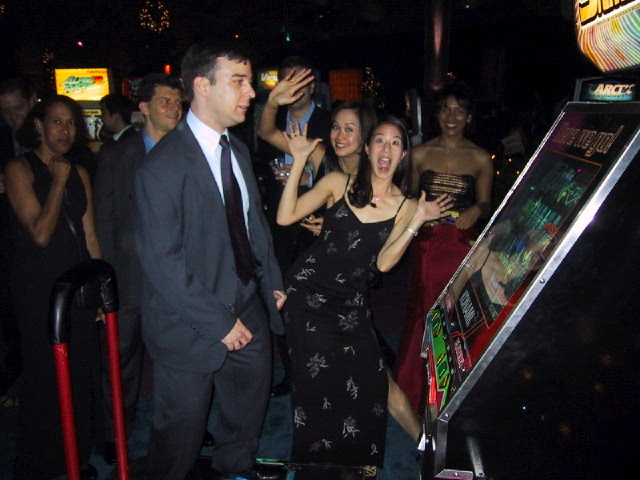 Nothing can be funnier than watching coworkers dressed in suits and formal dresses, including a founder of the company, stomping their feet blindly to a beat that can’t be heard because of the pounding bass of the live band overpowering the pounding bass of the DDR machine. Then showing off, even if it was only a medium difficulty song, because anything harder would have been close to impossible without being able to hear it. Then impressing said founder of the company. Heh. Yep, high point of the evening. Low point was the bus back to work not starting and having to move into another bus with all the belligerent drunks, the sick drunks, and the tired drunks, and not getting back home until 3am. Another layoff day, come and gone. Sunday, 2:00 p.m.: My head sort of hurts. Maybe I should eat something. Sunday, 5:00 p.m.: My head still hurts, I should take some medicine. And take a nap. Sunday, 7:00 p.m.: Nap over. Try to eat something. Pizza with spicy meat stuff on it does not go down well. Put back in refrigerator, go back to sleep. Sunday, 9:00 p.m.: Okay, I feel good enough to at least roam around, and finish that pizza. Sunday, 9:30 p.m.: Excedrin start to wear off; take more Excedrin. Try playing some video games. Ate some jellybeans. Sunday 11:00 p.m.: Tired. Bedtime. But I’ll read something first. Monday 12:00 a.m.: Perhaps eating jellybeans (sugar) and taking Excedrin (caffeine) wasn’t such a good idea. Monday 1:00 a.m.: Still awake. Change alarm from 9:15 to 9:45. Monday 2:00 a.m.: Still awake. Take a shower. Monday 3:00 a.m.: At least my bed is very comfortable. Change alarm to 10:45. Monday 4:00 a.m.: Bed is starting to get very warm. I consider going into work, but only very briefly. I feel the caffeine starting to wear off. Monday 4:30 a.m.: Unfortunately, the pain killers also wear off. I take some non-awakening ibuprofen, but am still in pain. Monday 5:00 a.m.: Clay arrives at work, and I’m still in pain, in bed, and wide awake. Monday 5:30 a.m.: Approximately, I fall asleep. Monday 10:45 a.m.: Alarm. Fortunately, no headache. Day begins.